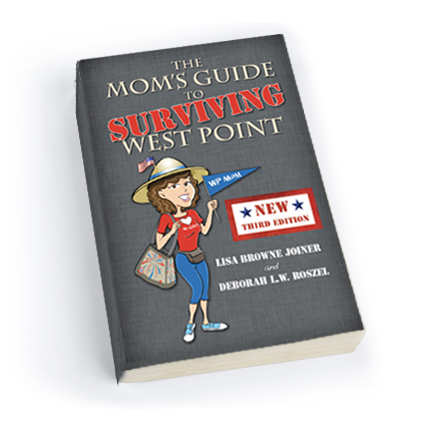 The Mom's Guide to Surviving West Point - Get the Book! "I've got to have this book!" Then you've come to the right place. The Mom's Guide to Surviving West Point is available in several locations - both real and virtual - and it's just $18.95 plus shipping! If you are in or near Highland Falls, NY, you'll find the book in the Daughters of the U. S. Army (DUSA) Gift Shop just outside the Thayer Gate at West Point. We appreciate their support of the book and would love it if you would stop by and pick up a copy when in the area. Click below to order directly from us. We'll even sign your copy and personally ship it! The book is also available online through Amazon.com or the Barnes & Noble website. Unfortunately, those copies can't be signed. If you're ready to make a purchase, please click the BUY NOW button below and your signed copy will soon be on its way. You will be taken to our checkout page on the PayPal website. You don't have to have a PayPal account to make a purchase. Just use your credit or debit card. You will be able to review your order before final purchase. WEST POINT PARENTS' CLUBS (or anyone else), click here for info on QUANTITY DISCOUNTS!